A new Street Church is launching in Hastings on Friday November 23. The all inclusive church is open to everyone in the community and welcomes homeless people and members of the LGBT community. 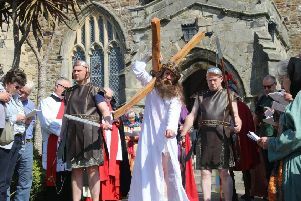 The church first started in Brighton, where it continues to be popular, but is keen to reach out to people in Hastings and Rother. SEE ALSO: Hastings man convicted of controlling behaviour told woman what to wear. Church administrator Philip Davis explained: “A large part of our work is with the homeless and vulnerably housed. “We have been invited by residents of Hastings to start an inclusive faith group and to extend our Street Church work. “We have been working with Councillor Nigel Sinden, Mayor of Hastings, and he will be attending the launch party of our Street Church Hastings event on Friday 23rd of November from 2pm - 5pm, opposite Pound Stretcher, in the town centre. “Street Church is an informal open-air service intended to be accessible to those who would not necessarily go to a traditional indoor church service. We offer communion and prayers, along with a non-judgmental ear for those who need someone to talk to. “We play contemporary Christian music and provide tea, coffee, hot chocolate, cold drinks, instant noodles, and biscuits, free of charge. Street Church services will take place weekly from 3.30pm - 5.30pm and all are welcome with no exceptions. See also: Could Beast from the East be making a return as Hastings area has first snow flurries. See also: Woman fined for improper use f Blue disabled badge.